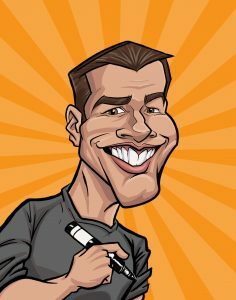 Since he could hold a pencil, Casey has been drawing and illustrating cartoons and characters his whole life and has been doing professional caricatures for over 8 years now. Getting his inspiration and style from a love of comics, cartoons and video games he is always exploring new techniques and practices to further his art. Attending Minnesota State University, Mankato, Casey received a Bachelor of Fine Arts degree in Graphic Design with a second concentration of Drawing. Currently residing in Mankato, MN, Casey will travel all over southern Minnesota and surrounding states to draw Caricatures for your special event.